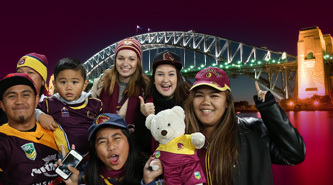 A day out at the footy is just the ticket for lots of families. There's nothing better than the smell of footy season in the air, the nights get colder, guys start wearing football jerseys again, and the TV seems to be full of the Footy Show and NRL games. The rest of the rounds are not yet released as at the date of this article, check here for updates on the last few rounds. Tickets to Broncos games come in lots of price ranges and packages, depending on your budget. Adult earlybird tickets start at $28.55. The earlier you buy the cheaper the tickets are, and obviously the better seats close to the centreline with shade cover are more expensive. Children and concession are able to purchase cheaper tickets. The Broncos offer a 4 game pack ticket - the Awesome Foursome - which not only gives you your choice of 4 games but also includes Broncos extras such as a lanyard, membership card, bumper sticker, merchandise voucher and priority access to big game tickets. These tickets are $120 for white seating, $150 for blue seating and $180 for gold seating. Again, concession and children are able to purchase the passes for cheaper. Besides the Awesome Foursome, other Broncos membership packages vary in price and inclusions, dependent on whether you can make it to all games or not. There is a huge variety including memberships for Sydney based fans, Melbourne based and NZ based supporters. They also have packs for supporters who cannot make it any games but just want to be a supporter with the promotional merchandise. A full season premium supporter membership including attendance at all home games is $270. The Broncos play at Suncorp Stadium, Castlemaine Street, Milton. 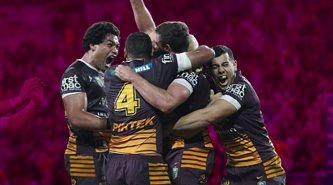 Images are reproduced courtesy of the Brisbane Broncos official website.